GALION — Galion City Council took action Tuesday night to approve the annexation of about 4 acres of property. The real estate is roughly north of the Sleep Inn on Ohio 598, just south of the U.S. 30 interchange. That annexation will pave the way for more development in the area, and possibly improve the chances of some traffic signals in that area. 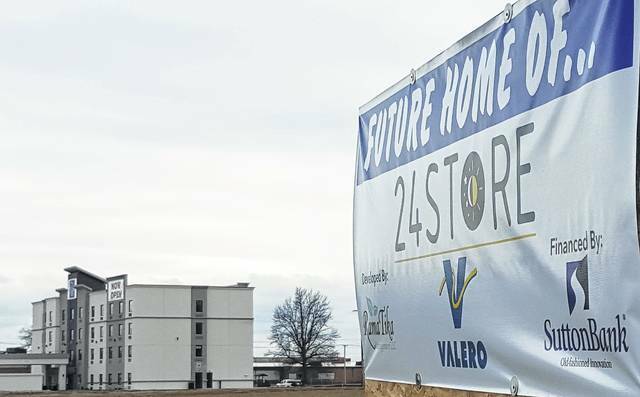 In March, Mayor Tom O’Leary reported at a city council meeting that Valero is planning on opening a 24Store and service plaza in the area north of the new Sleep Inn, between Brandt Road and U.S. 30. A sign on the approximate site of the plaza went up at that time. “We’re also working on a possible land donation of several acres that will help in the further development of that area,” O’Leary said at that meeting. That land donation (annexation) timetable took an unexpected jump forward recently. Because the land — situated in Jefferson Township — is wholly owned by the state of Ohio, it drastically reduces the amount of paperwork and hurdles that must be jumped through before annexation can take place. Legislation passed Tuesday authorizes Galion Director of Law Thomas Palmer, on behalf of the city of Galion — and declaring an emergency — to file the petition to annex about 4.012 acres with the the Crawford County Board of Commissioners. The city expects no opposition from the state, nor county commissioners, who must approve the annexation request. “Once we file the petition for annexation, it can become effective immediately,” Palmer said. A construction timeline for the Valero site has not been finalized. Rama Tika Management Company of Mansfield is the developer for the project. Valero operates a service station off U.S. 30, near Ohio 314 and West Fourth Street. More recently, the company opened a facility at the intersection of West Fourth Street and North Home Road in Mansfield. Mayor Tom O’Leary hopes construction can start early next year. At an October council meeting, O’Leary also cleared up any confusion about a recent auction sign posted on the land where the new Valero plaza is being planned that led area residents to believe that the Valero project was not going to move forward. “The auction signs that were put up were for the sale of the timber only on that land,” O’Leary said. Russ Kent | Galion Inquirer The timeline to annex about 4 acres north of the Sleep Inn on Ohio 598 took a big leap forward in recent days and could speed up by many months the development of that area. https://www.galioninquirer.com/wp-content/uploads/sites/38/2017/11/web1_valero-hotel.jpgRuss Kent | Galion Inquirer The timeline to annex about 4 acres north of the Sleep Inn on Ohio 598 took a big leap forward in recent days and could speed up by many months the development of that area.